The Regolini Galassi tomb application was shown in Rome from the 15th of April till the 20th of July 2014 in the context of the exhibition Les Etrusques et la Méditerranée. La cité de Cerveteri/Gli Etruschi e il Mediterraneo. La città di Cerveteri, together with more than 450 masterpieces of the Etruscan culture. This exhibition showed several precious objects belonging to the Regolini-Galassi grave goods, together with the Sarcophagus of the Spouses (from the Louvre), the sculpted group of Greppe S. Angelo, terracotta objects from the museums of Berlin, Copenhagen and the Vatican Museum, finds from the Pyrgi sanctuary and some of the most recent discoveries carried out in the urban area of Cerveteri, in the necropolis and in the surrounding territories. 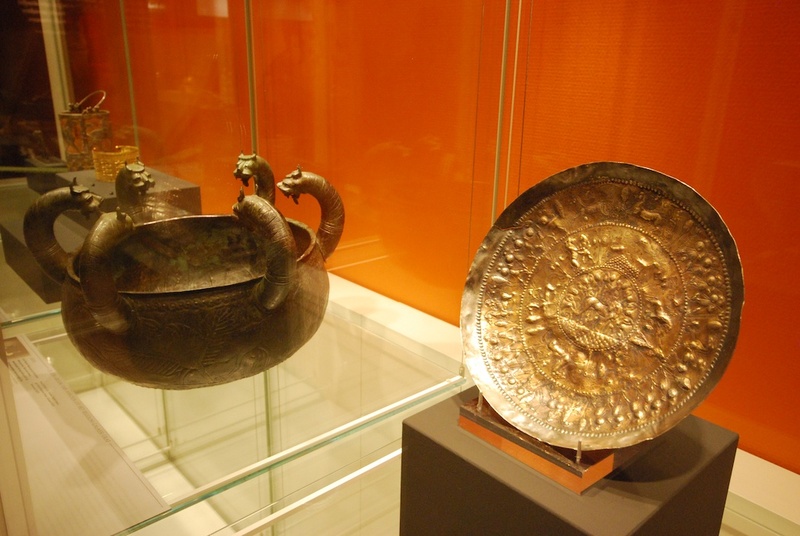 The exhibition showed the relationships that Etruscans had in the Mediterranean area through the history of Cerveteri, one of their most important cities. 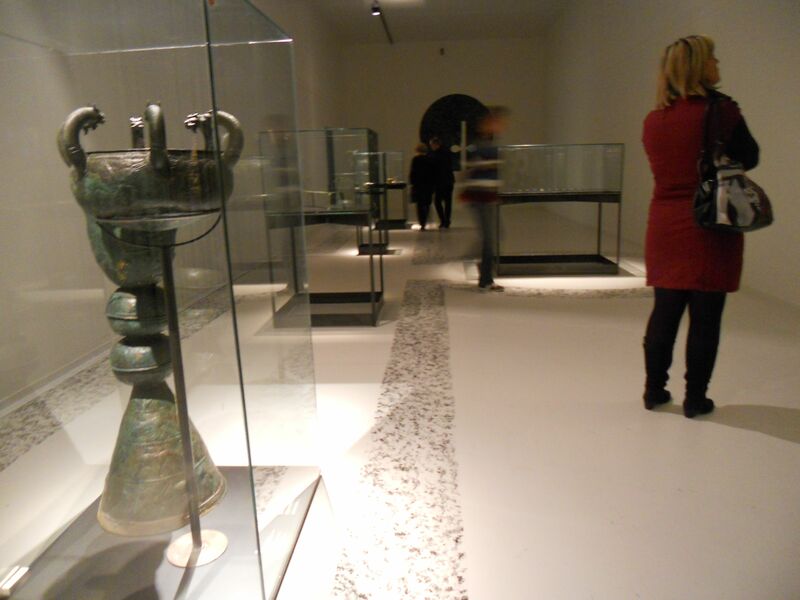 This exhibition was curated by F. Galulier, L. Haumesser, P. Santoro, V. Bellelli, A. Russo Tagliente and R. Cosentino. The exhibition has been jointly organized by Louvre Lens and Palaexpo, thanks to the collaboration between the Département des antiquités grecques, étrusques et romaines of the Louvre, the Istituto di studi sulle civiltà italiche e del Mediterraneo antico of the CNR and the Soprintendenza per i beni archeologici dell’Etruria meridionale. 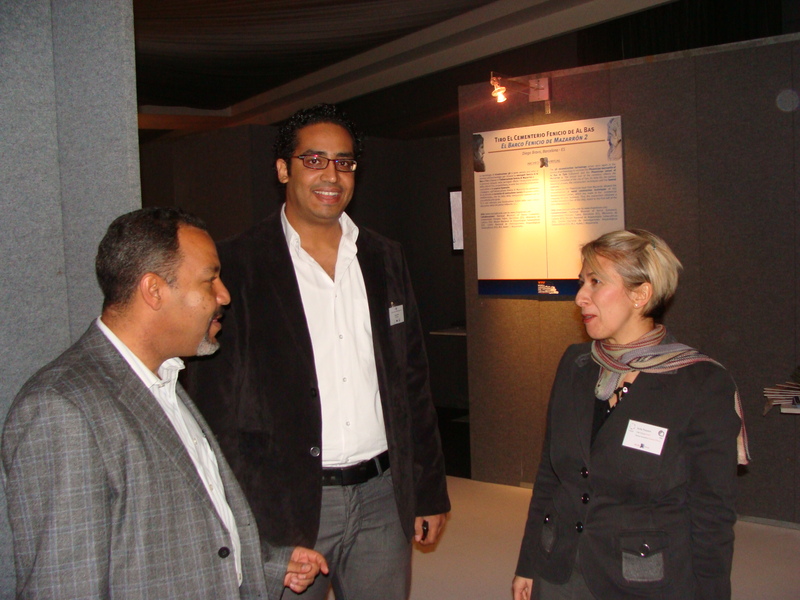 It had already been hosted in the Louvre Lens from the 5th December 2013 till the 10th of March 2014. The Etruscanning application showing the reconstructed Regolini-Galassi tomb is part of a technological exhibition Italia del futuro, that is travelling around the world. 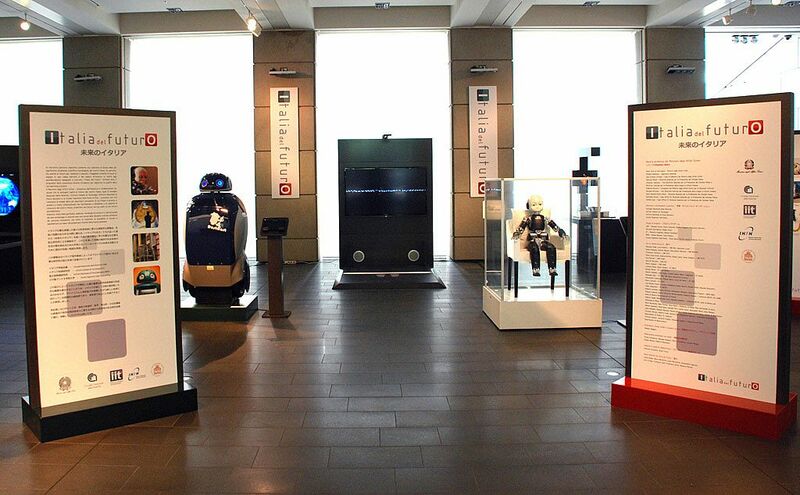 The exhibition is organised and promoted by the Italian Ministry of Foreign Affairs. 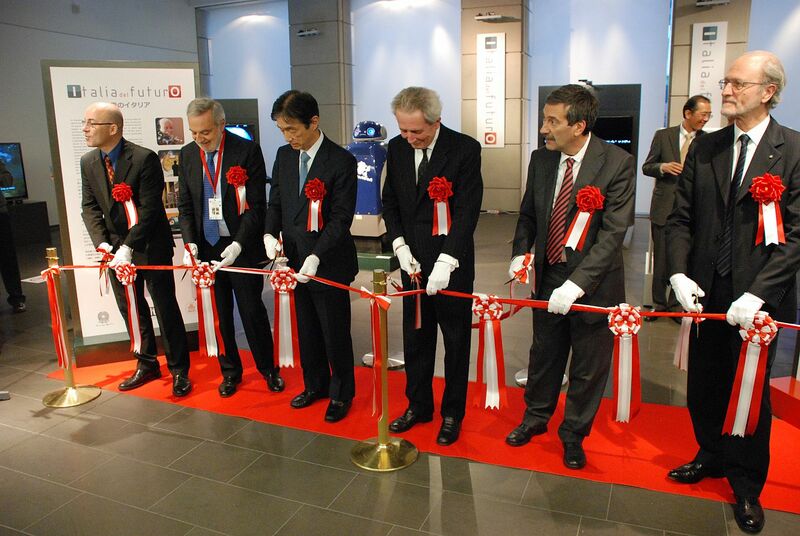 Recently, the exhibition was shown in Tokyo, in the Istituto Italiano di Cultura from April 17 to May 17, 2013. 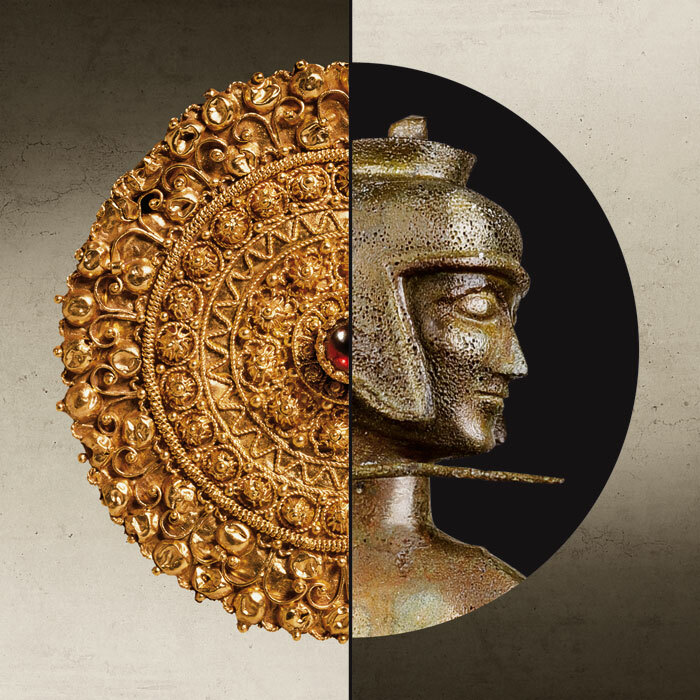 The Etruscanning application is a contribution of CNR to this exhibition, as example of virtual heritage. The president of CNR, Doct. Luigi Nicolais, was present at the opening of the exhibition (second person from the left in the image below). The next stop of this exhibition will be in San Franscico, USA, from July 12 to August 23, 2013. This blog is part of the Etruscanning 3D project, that is being partially funded with support from the European Commission. This blog reflects the views only of the author, and the Commission cannot be held responsible for any use which may be made of the information contained therein. 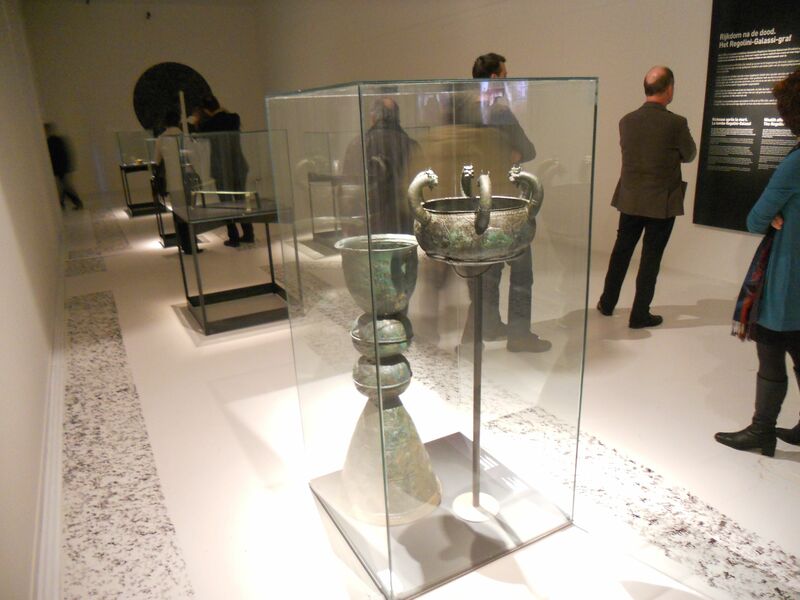 On March 15, 2013, the Gallo-Roman museum of Tongeren, Belgium opened a great exhibition on the Etruscans, named Una Storia Particolare. The exhibition shows a excellent selection of Etruscan objects and ends with the Regolini-Galassi tomb. Many objects on display are on loan from the Allard Pierson Museum in Amsterdam, the National Museum of Antiquities in Leiden and the Vatican Museums. In a separate room, the contour of Regolini-Galassi tomb has been depicted on the floor and some of the objects from the tomb are on display, positioned on the same place as in the original tomb. 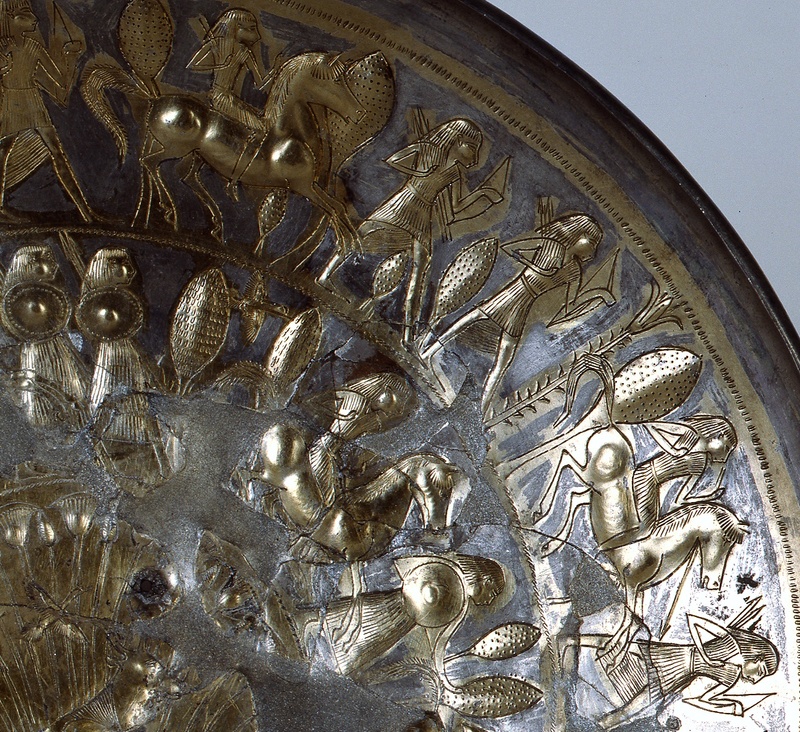 Key objects which are on display are the six-headed lebes and the bronze holmos. 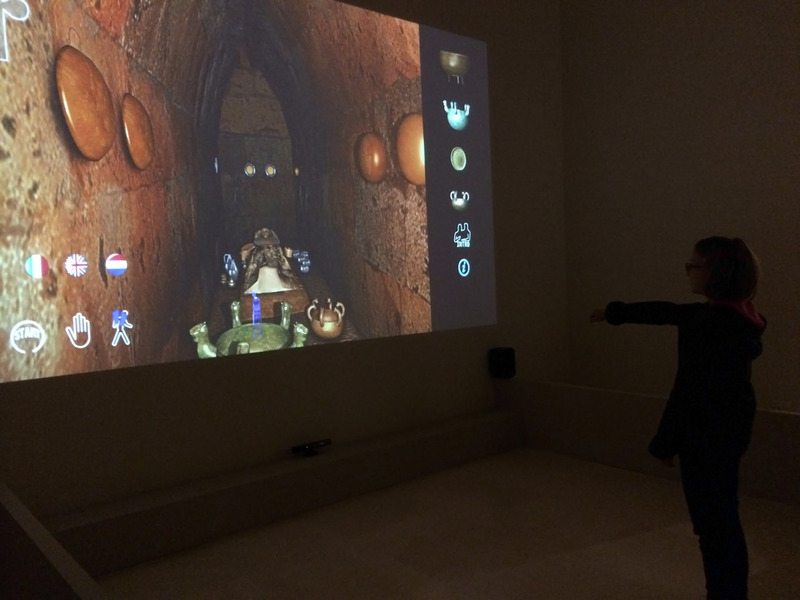 Next to the objects from the Regolini-Galassi, the Etruscanning3D application has been installed, showing the tomb and about 80 digitally restored objects in an interactive way through virtual reality. This serious games setup is based upon a Kinect camera and uses the version of the software with the hotspots. The exhibition is open until August 25, 2013. More practical information can be found here. 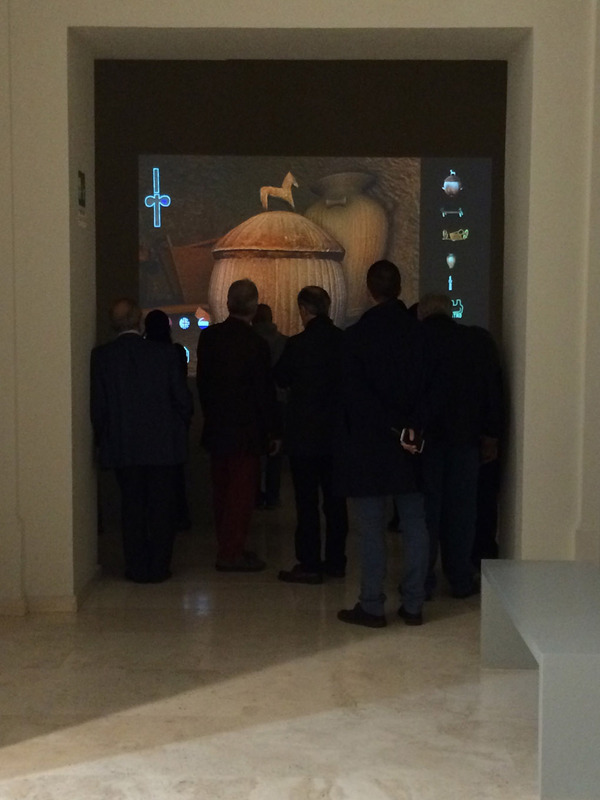 Every year, the Virtual Heritage Lab at CNR-ITABC organises the ArcheoVirtual exhibition at the Borsa Mediterranea del Turismo Archeologico and shows the best applications in archaeological visualisation. This year, the V-MusT.net Network of Excellence, coordinated by CNR-ITABC, used the venue to organise two workshops on museum technology plus several other meetings. One of the ArcheoVirtual stands that attracted the most interest was Etruscanning with the VR visualisation of the Etruscan Regolini-Galassi tomb. The application on display was the improved, second version in Italian. We made a small video on how this second version of the VR application on the Regolini-Galassi tomb looks like. Work continues to improve the digital museum objects through digital restoration and image based digitisation. The Dutch version of this improved application will be installed soon in Amsterdam and Leiden. 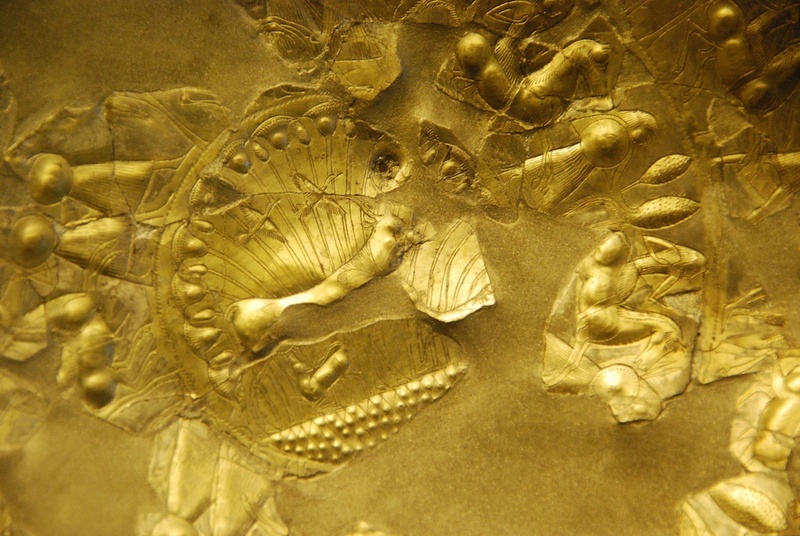 The Regolini-Galassi tomb contained several outstanding silver and gold objects, now preserved in the Museo Gregoriano Etrusco in the Vatican. 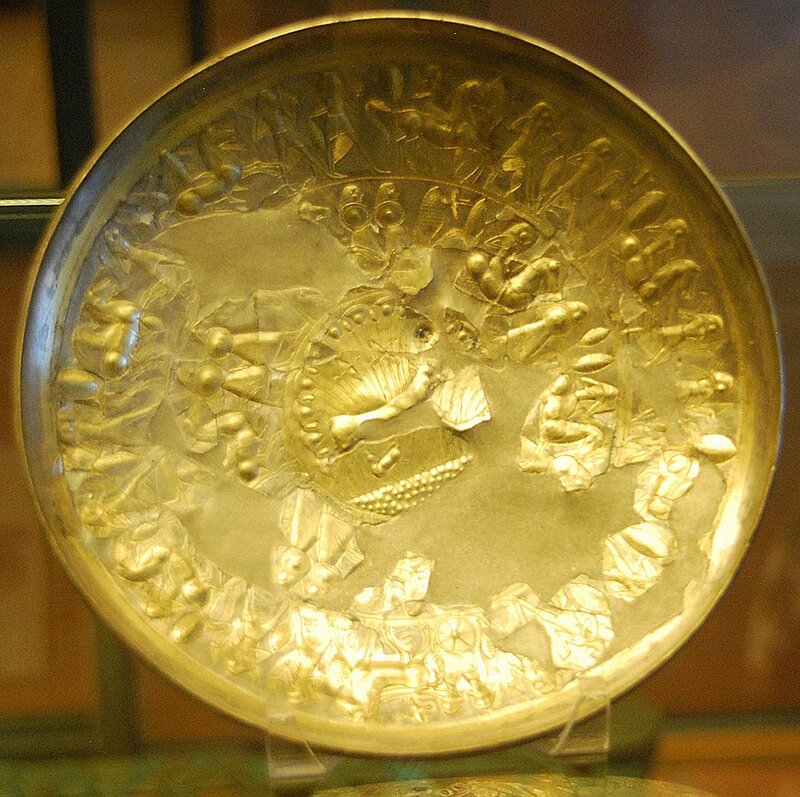 One of the most interesting objects is a patera, in silver and plated gold, that was nailed to the wall of the tomb (see image below, showing its restored state, inv. nr. 20364) and that was uses for libation offers in religious rituals. This patera most probably broke in pieces when being hit by stones from the collapsing roof in the cella of the tomb. 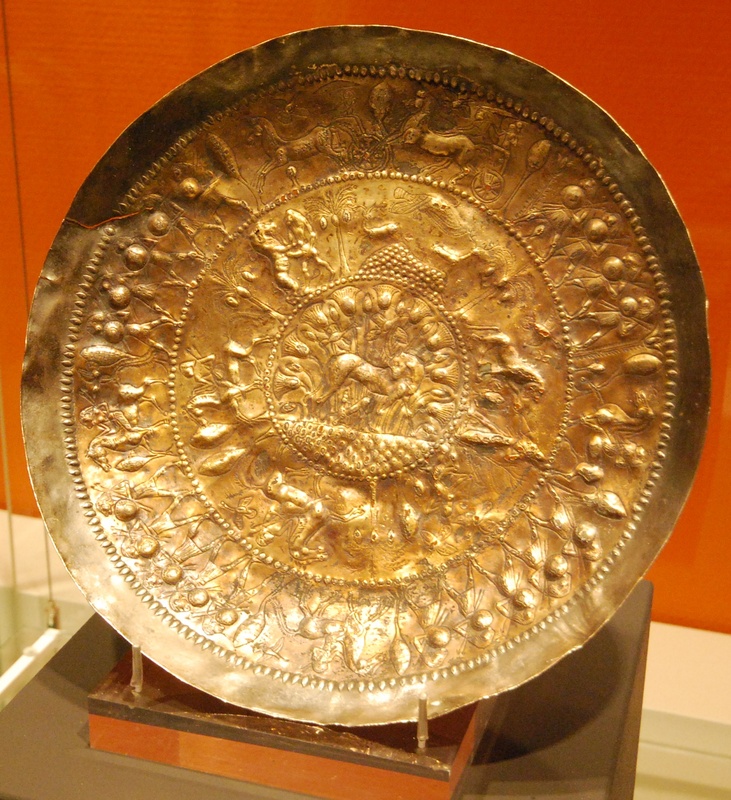 This patera is one of a set of silver objects from this tomb that are being produced in a Phoenician style with Egyptian decorations. 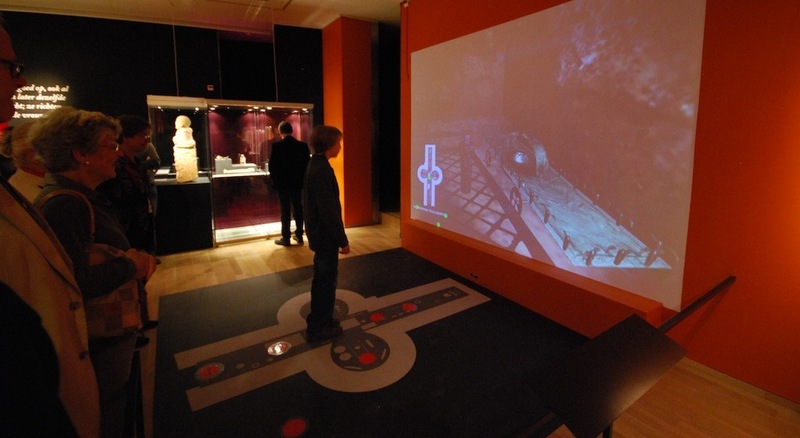 A very similar patera is preserved in the National Museum of Antiquities in Leiden, the Netherlands, and has been integrated in the exhibition “Etruscans: Emminent Women, Powerful Men” next to the Etruscanning VR installation that shows the virtual Regolini-Galassi tomb. 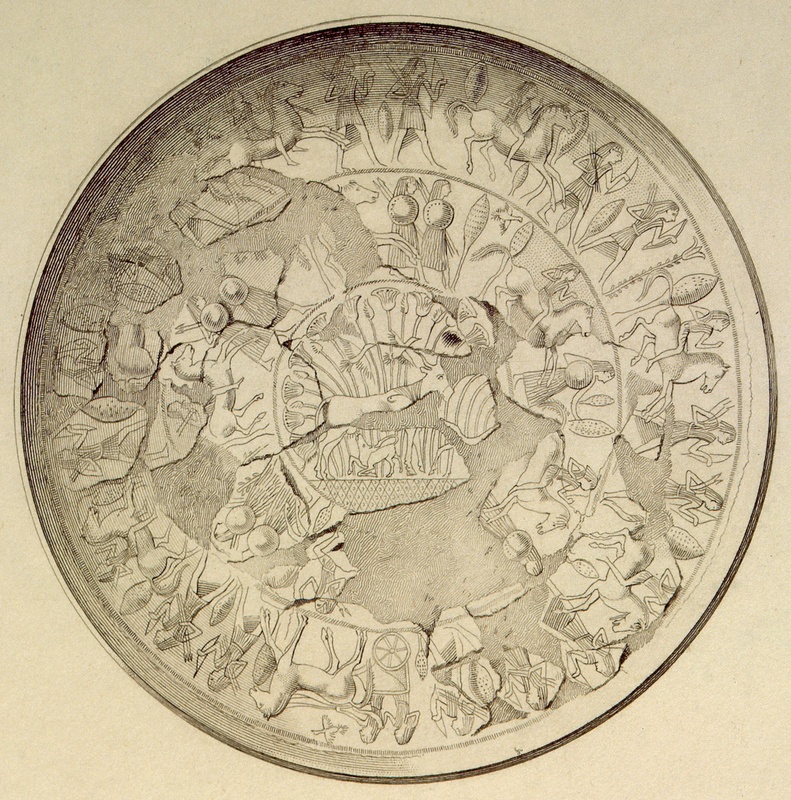 The provenance of this patera is unknown but scholars believe it originates from the Etruscan Barberini tomb, that has been excavated in 1855 and is dated around 630 BC. As all objects in the 3D virtual reconstruction of the Regolini-Galassi tomb are visualised in their original state at the closing of the tomb, extensive digital restoration is needed for most objects. As the 3D visualisation of the RG tomb happens in real time, and as we want the digitally restored objects to have very fine detail, we developed an innovative digital restoration technique that can be applied to most of the objects of the tomb. 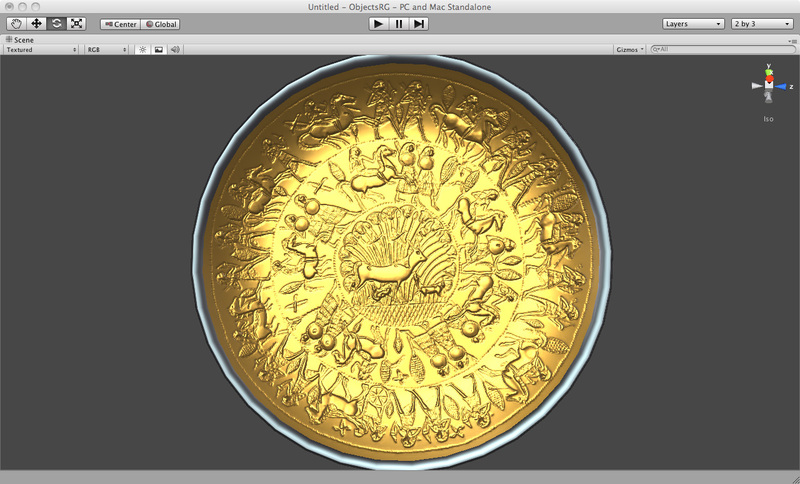 This technique simulates the surface details of the objects (such as engraving, embossing, …) and turns them into a very efficient visualisation that can be used in real time systems. So, let’s have a look at the digital restoration of the above mentioned patera. 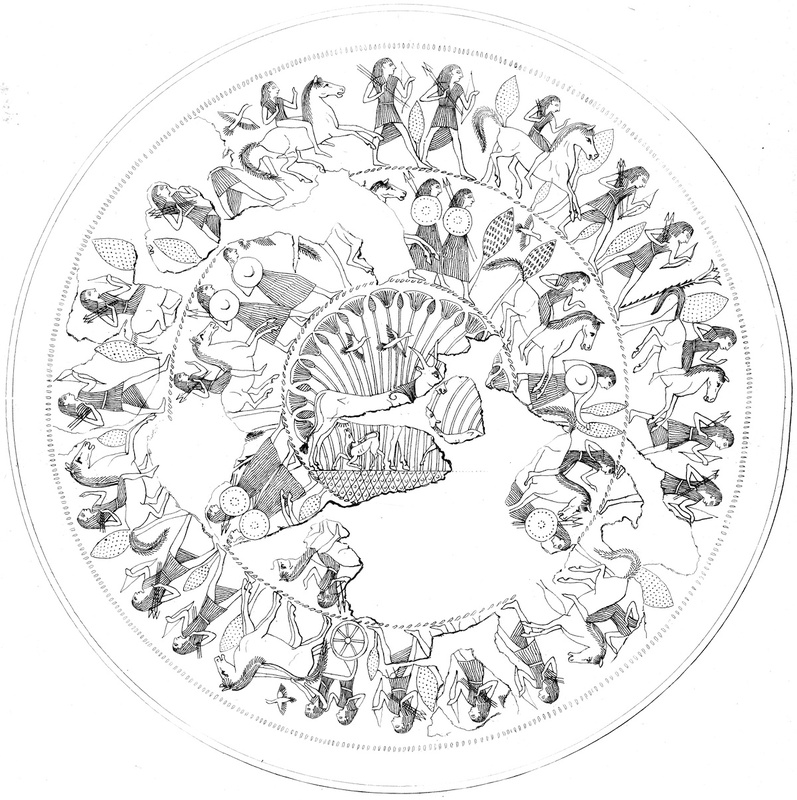 We start with the drawings by Grifi in 1841 of the first restoration of the patera and an improved restoration by the restoration labs of the Vatican Museums in 1999. When comparing both restorations, one can see that there are slight differences between these restorations but also that the 1841 drawings show more details than the 1999 restoration. Possibly, some detail was lost in the first restoration or in undoing the first restoration. When analysing the engravings, one can see that several motives are repeated one or more times, so that nearly always we can find information about missing parts by looking at other instances of the same drawing on another place of the engraving. When doing so, very little uncertainty is left what to fill in, only a few details such as a bird or a tree have been filled in by analogy. 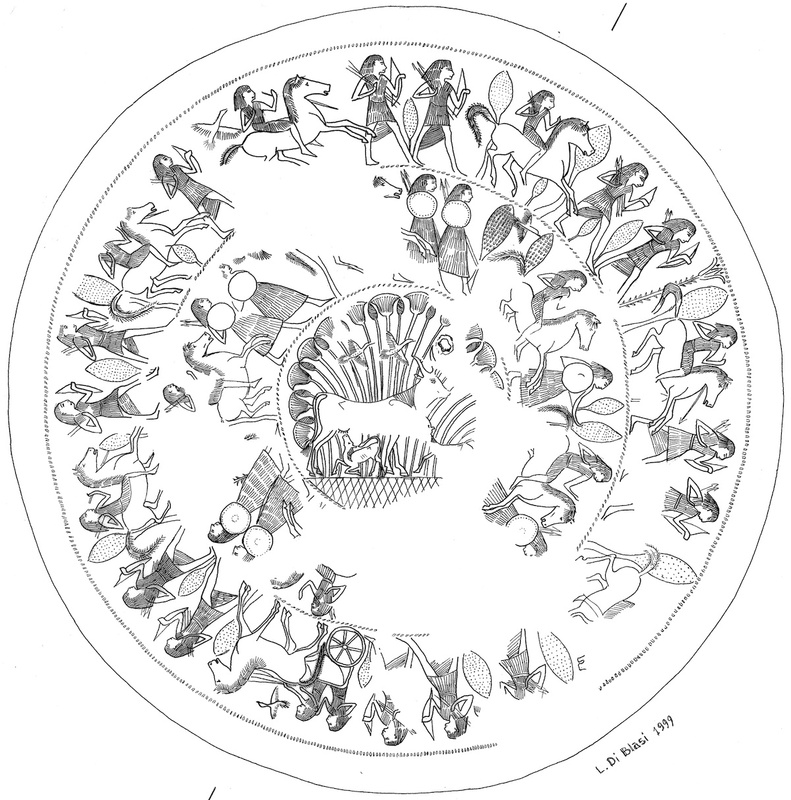 We also compared closely with the similar patera from RMO, shown above, to come to the most probable digital restoration of the engraving (see drawing below). 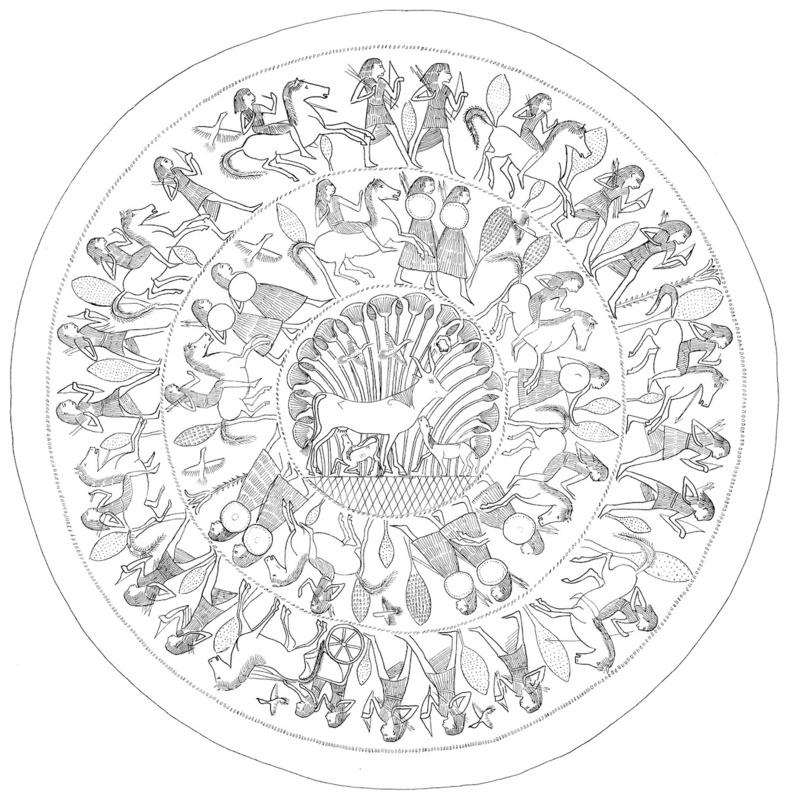 In a second step, we simulated the production process of the patera by creating a displacement map from this engraving. This displacement map shows as a black and with image the small height perturbations that are created by the engraving (and subsequent deformation of the metal around the engraved lines) on the front of the object and the embossing (created by hammering from the back of the object). The embossing is created manually by simulating the impression of the blunt chisel, after studying carefully the high resolution images of the object (see image below). All these different processes yield different displacement maps which are composed as layers in Photoshop. 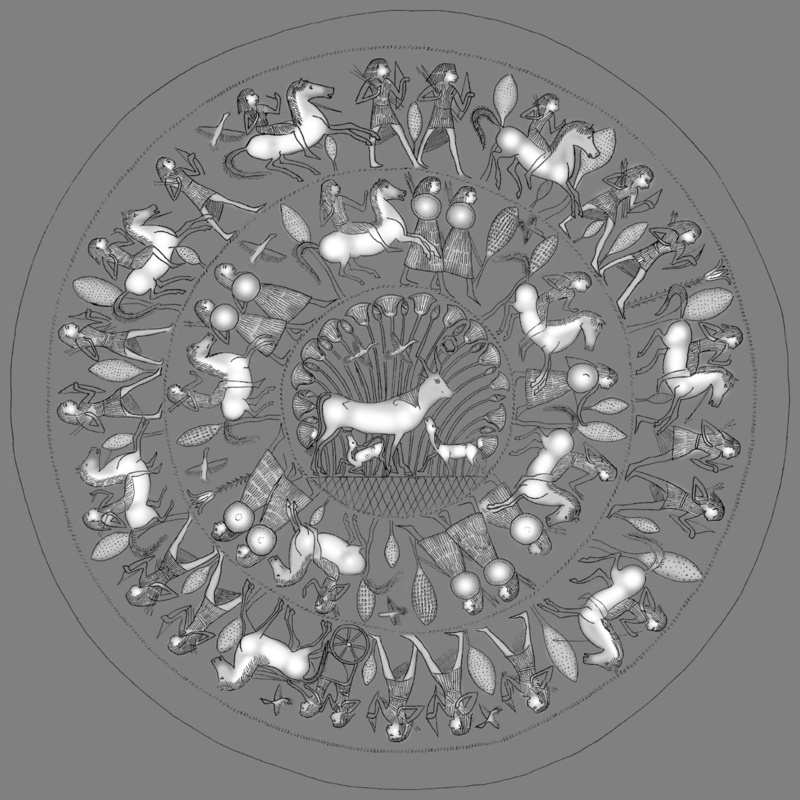 The resulting displacement map is a precise simulation of the relief of the complete, undamaged patera (see image below). 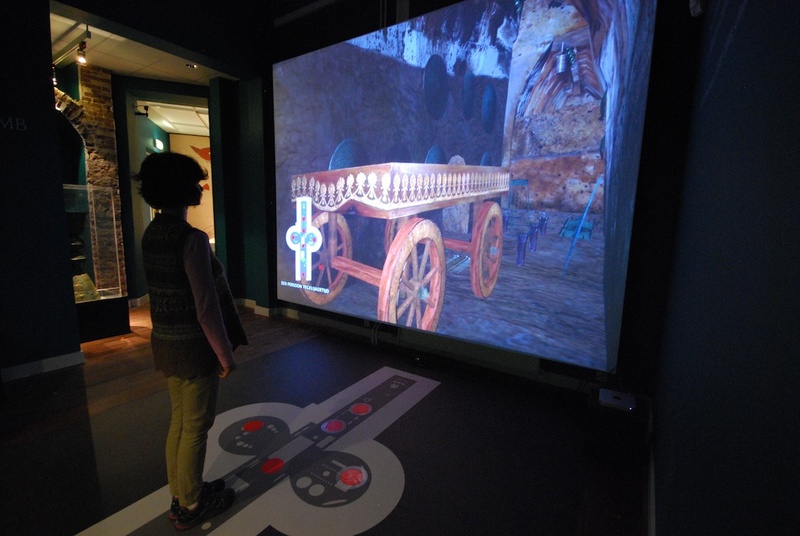 The Etruscanning VR application uses Unity 3D as software to create and visualise the virtual tomb with its animated objects and narrated stories. In Unity 3D, a displacement map can be transformed into a normal map, which allows to visualise very efficiently the relief of objects. In this way, we visualise details of less than 1/10th of a milimeter on the surface of this object through a very lightweight 3D object (together with 80 other 3D objects) in a realtime system, running on a small, cheap computer (in our case a Mac mini). On the other hand, displacement maps are an optimal and easy approach for digital restoration. In the Leiden exhibition, the digitally restored patera can be confronted with the similar patera from the Barberini tomb, on display next to the VR installation, showing the added value of digital museum objects. 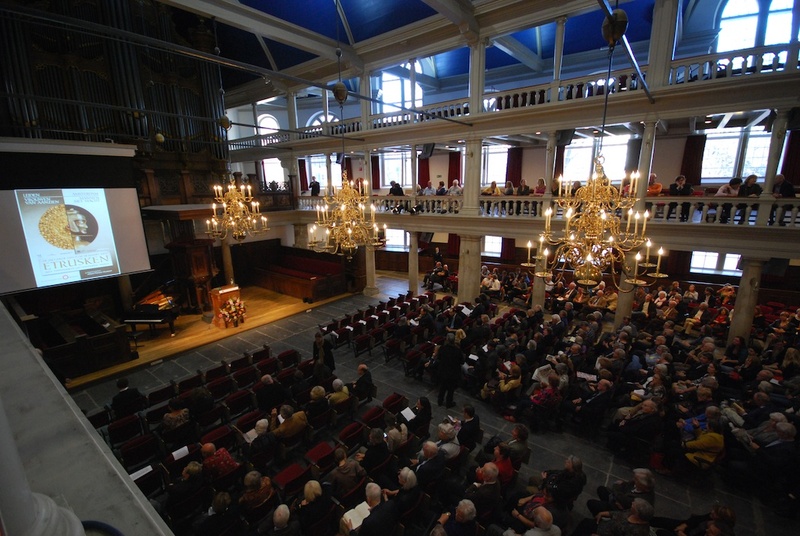 On October 13, 2011, the double exhibition Etruscans was opened in Amsterdam in the aula of the University of Amsterdam, attended by 700 people, including a large Italian delegation, with representatives of the museums that cooperate in these exhibitions and the Etruscanning team. This academic session was opened by Wim Hupperetz, director of the Allard Pierson Museum and coordinator of the Etruscanning project, which created for these exhibitions an interactive VR application to explore the Regolini-Galassi tomb through natural interaction. The exhibition in the Allard Pierson Museum focuses on “Powerful Men“. 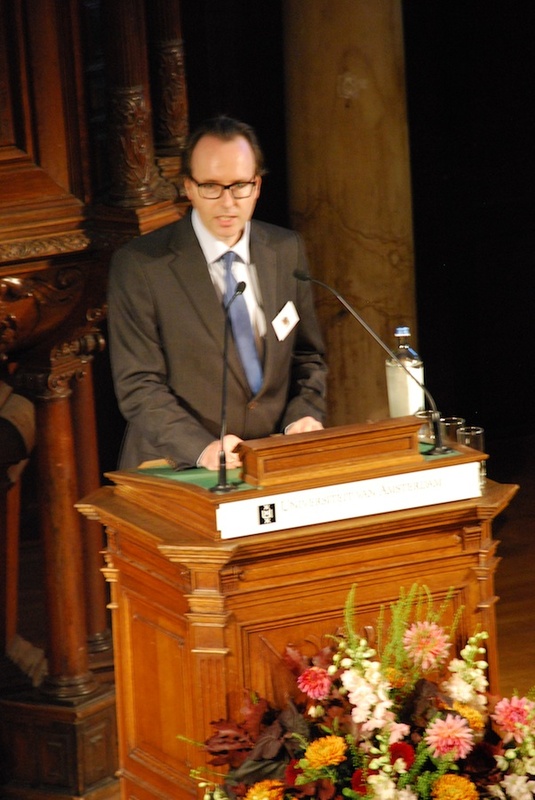 Images of the setup in Amsterdam can be found in the previous blog entry. On October 14, 2011, the exhibition on Etruscans opened in the National Museum of Antiquities in Leiden, focused on “Eminent Women“. 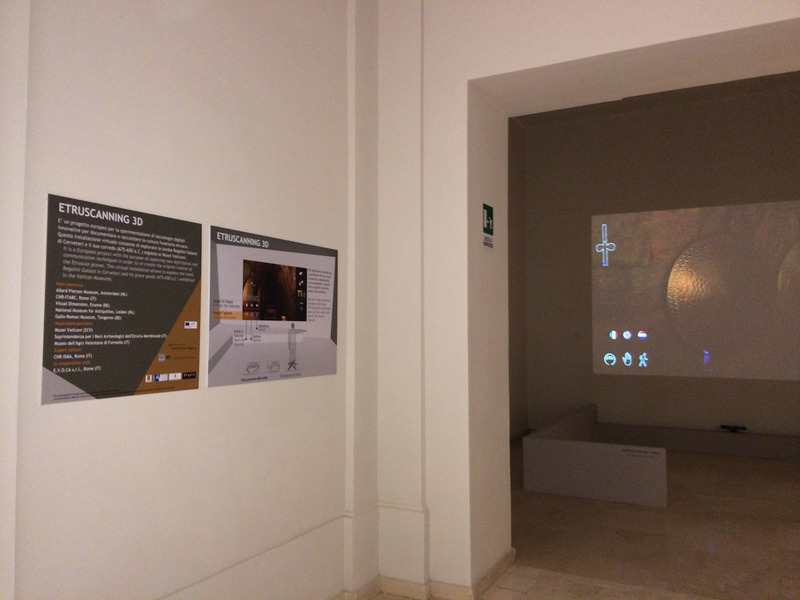 As the Etruscanning VR application shows the Regolini-Galassi tomb, in which both a leading woman and man were buried, it is shown in both exhibitions. Below are two images showing the setup in Leiden during the evening of the opening in which around 1300 people visited the museum. 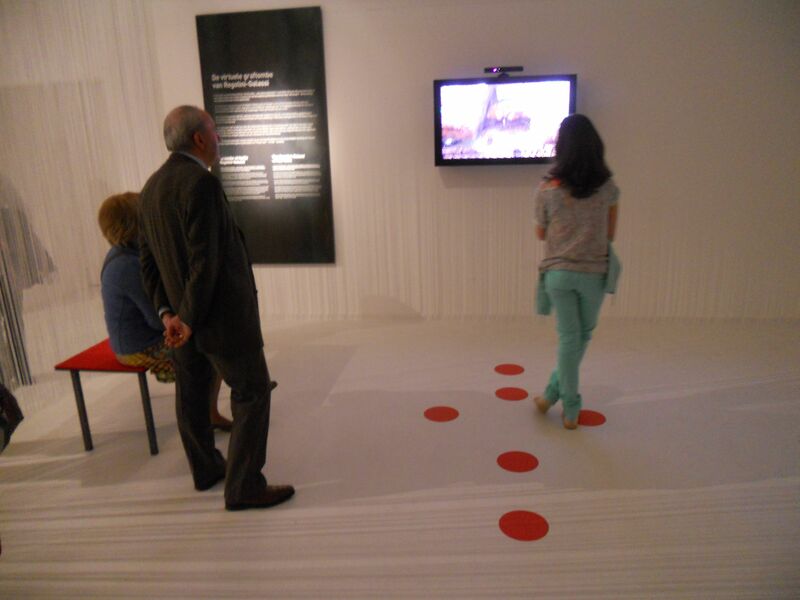 Currently, the interactive virtual reality application in both museums is shown with storytelling in Dutch. An English version of the narration has been recorded and an Italian version is being prepared for recording. Both versions will be shown at the ArcheoVirtual exhibition at the Borsa Mediterranea del Turismo Archeologico (Nov 17-20, 2011, in Paestum, Italy). The Etruscanning research continues, on the digital restoration of the objects, on their optimal representation in a real time 3D system and on the use of gestures to select and manipulate objects. An updated version of the application, providing more focus on the digitised museum objects, will be shown at the Museum Night in Amsterdam on Nov 5, 2011. We hope to show a gesture based version in both exhibitions by January 2013. 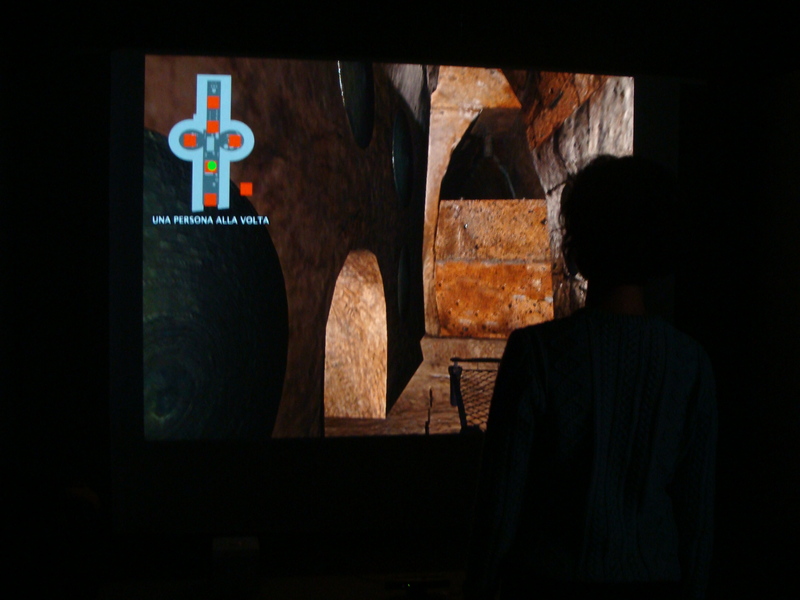 During 2012, a second Etruscan tomb will be reconstructed and visualised with the same approach. 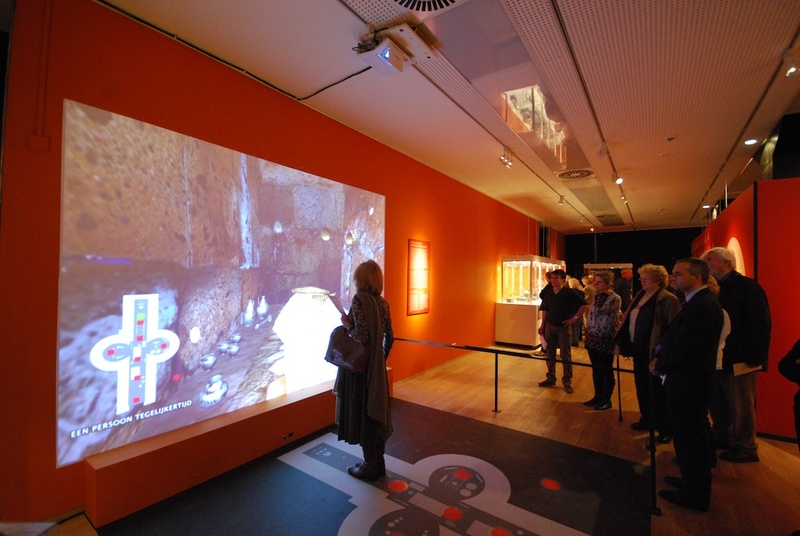 Interactive VR visualisations of both tombs and their objects will be integrated in a prestigious exhibition on Etruscan culture in the Gallo-Roman museum of Tongeren, Belgium in January 2013. 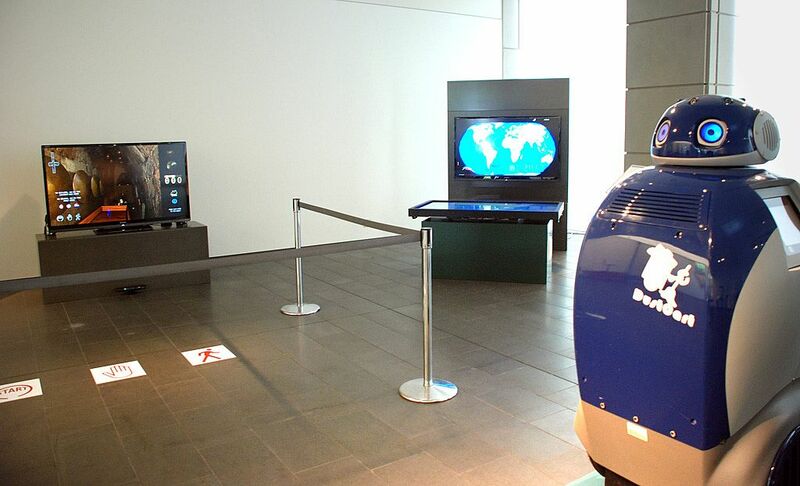 The development of museum VR installations based upon natural interfaces, such as this Etruscanning project, is an exciting, new way of integrating interactive 3D into museums and exhibitions. CNR-ITABC developed a very first version of this technology in the temporary exhibition Colors of Giotto (video) with a lot of success. The assessment of the fitness for use and robustness of implementation of this Etruscanning application is carried out by the European V-MusT.net Network of Excellence, that focuses on museum technology and virtual museums. The research is carried out by the Heritage Lab of the Allard Pierson Museum, that is a leading partner within the V-MusT.net consortium.